On 27 February 2009, the Polish Patent Office granted the right of protection for the word trade mark PARADA R-215899 applied for the goods in Class 18 such as leather and imitations of leather, and goods made of these materials and goods in Class 25 such as clothing made of natural and synthetic materials, leather garments, footwear, headgear, by the Polish company HenMar sp. 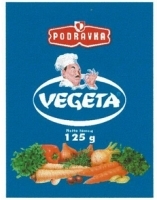 z o. o. from Dębica. PRADA S.A. from Luxembourg filed a notice of opposition. The company argued that the trade mark PARADA is confusingly similar to its word-figurative trade mark PRADA IR-650695 registered in Poland with the earlier priority of 1995, for goods in Class 18 and Class 25. The Adjudicative Board of the Polish Patent Office in its decision of 12 October 2012 case no. Sp. 30/11 ruled that PARADA and PRADA are not similar. In the opinion of the PPO, although compared signs are composed of similar letters, however, the deciding factor was the conceptual aspect of both trade marks. In Polish, the word “parada” has a specific meaning and means, among others, spectacular show with the participation of many people (parade). The PPO decided that the semantic aspect proves that both signs will be perceived differently and there is no risk of misleading the public as to the origin of goods. Further allegations, based on the reputation of PRADA trade mark, have become, therefore, irrelevant. The decision is not final yet. The complaint may be filed before the Voivodeship Administrative Court in Warsaw. Categories: Art. 132(2)(ii) IPL | Art. 132(2)(iii) IPL | company name or firm | personal rights or interests | Polish Act on Industrial Property Law | Polish law | Polish Patent Office | reputed trade marks | similarity of goods | similarity of signs | trade mark opposition | trademark law. BP p.l.c filed before the Polish Patent Office a request for the invalidation of the figurative trade mark R-218916 registered for goods and services in Class 4, 31 and 39 and owned by Albert Korman. 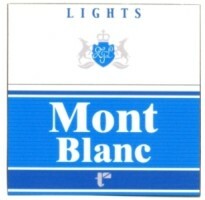 BP claimed similarity to its figurative CTM no. 1916550, word-figurative CTM BP no. 4100335 and figurative CTM no. 4236279, that were registered with the earlier priority for goods and services in the same classes. BP noted that it uses a combination of green and yellow colors, especially green and yellow figurative element of the trending-like sun rays on a circular or semicircular shape, for the identification of its services. The Company argued that the goods and services of the trade mark at issue are the same or similar. BP also relied on the judgment of the Polish Court for the Community Trade Marks and Community Designs case file XII GWzt 15/08 in which the court found that the BP’s trade mark is highly distinctive, which may result from both the lack of descriptive elements in the sign as well as with the reputation and goodwill, which the mark has among the buyers. The Voivodeship Administrative Court in Warsaw in its judgment 11 April 2012 case file VI SA/Wa 137/12 ruled that due to the fact that the Polish Patent Office correctly decided that there were no indications that the applied trade mark was identical or similar to a trademark for which a right of protection was already granted , therefore, it was pointless to assess the reputation of the previous sign. Since the PPO properly determined that the marks are not similar, any considerations about the use of another’s reputation were not justified. The Court repeated that dissimilar signs cannot produce associations, so there can be no conscious imitation and profiting from someone else’s reputation. The correct view is that the lack of similarity between the signs eliminates the need to examine the use of another’s reputation, as the “precondition” of accepting the argument that the use of reputation has happened, is to determine the similarity between the signs, and the second condition is to establish the applicant’s trade mark has the reputation. This judgment is not final yet. Categories: Art. 132(2)(ii) IPL | Art. 132(2)(iii) IPL | double color | non-traditional trade marks | Polish Act on Industrial Property Law | Polish Patent Office | reputed trade marks | similarity of goods | similarity of services | similarity of signs | single colour | trade mark invalidation | trademark law | Voivodeship Administrative Court. 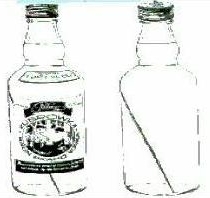 POLMOS BIAŁYSTOK S.A. requested the Polish Patent Office to invalidate the figurative 3D trade mark WISENT VODKA PŁ 1764 DISTILLED & BOTTLED IN POLMOS LANCUT POLAND R-191793 owned by Fabryka Wódek POLMOS ŁAŃCUT S.A. POLMOS BIAŁYSTOK is the owner of the figurative trade mark POLMOS ŻUBRÓWKA BISON BRAND VODKA R-62081 and the 3D trade mark R-85811 depicting a bottle with a blade of grass inside, that were registered with the earlier priority. 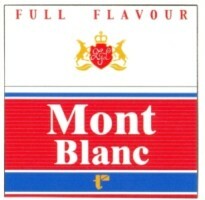 POLMOS BIAŁYSTOK argued that there exists the risk of misleading the public because of the similarity of trade marks. 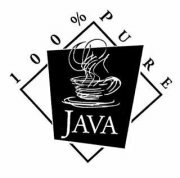 The similarity is based on the distinctive element – a blade of grass, that is the distinguishing element of Żubrówka bottle, which leads to the fact that consumers associate the brand with these trade marks. POLMOS BIAŁYSTOK provided evidence that Żubrówka is one of the most popular vodka brands on the Polish market, as well as studies on the presence of Żubrówka brand in the market, materials on advertising campaigns, a research on consumer choices in buying of vodkas. The Company also argued that “a blade in a bottle” was commonly associated with Polmos alcohol trade marks in 1999, when the trade mark portfolio was divided between different companies. POLMOS BIAŁYSTOK claimed the reputation of the trade marks R-46050, R-62081, R-80991, R-85811 and R-125 911, the same as the reputation of Żubrówka vodka trade marks that were acquired by the company. 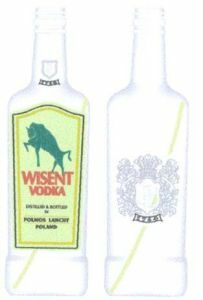 POLMOS ŁANCUT argued that the motifs of the wisent and a grass blade will not change the overall assessment of the compared trade marks, and as such, are associated with this type of vodka. 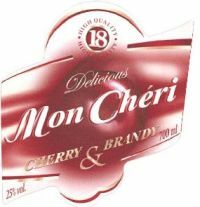 In particular, the grass – Hierochloe odorata, which is necessary for the production of this kind of flavoured vodka. POLMOS ŁAŃCUT noted that the appropriation of these elements in favor of one company would not be justified, because it would limit the freedom of the activities of other competing entrepreneurs. 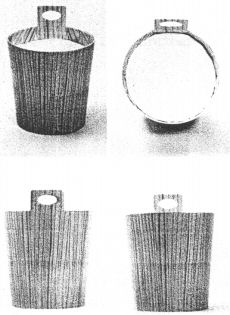 POLMOS ŁAŃCUT provided examples of rights of protection for trade marks containing elements such as leaves and fruit of the rowan, drawings of a coconut or cherry, which are the signs used to mark of products in Class 33. The Polish Patent Office dismissed the request. The PPO agreed that mentioned trade marks are reputed, but they were not similar. 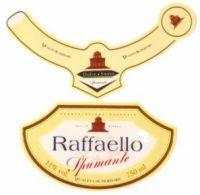 The PPO also noted that in the case of trade marks for alcoholic beverages, the consumer’s attention is directed primarily at the label and its contents, as part of communicating the essential information about the brand, type and manufacturer of purchased product, and only then – on the other elements, such as the shape of the bottle or its contents. The PPO decided that POLMOS ŁAŃCUT did not derive any benefits from the reputation the earlier marks. POLMOS ŁAŃCUT carefully created its trade mark in order to fundamentally distinguish it from earlier signs owned by POLMOS BIAŁYSTOK. The only common associations that the compared signs raise come down to the fact that they serve to mark the same kind of vodka. CEDC INTERNATIONAL Sp. 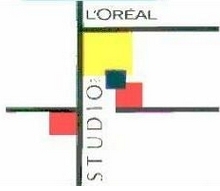 z o.o., the successor of POLMOS BIAŁYSTOK, filed a complaint against this decision. The Voivodeship Administrative Court in Warsaw in its judgment of 3 April 2012 case file VI SA/Wa 16/12 dismissed it. The Court held that the decision of the PPO did not violate the law in force or the methodology for comparison of trade marks. This judgment is not final yet. Categories: 3D trade mark | Art. 107 §3 APC | Art. 131(2)(i) IPL | Art. 132(2)(ii) IPL | Art. 132(2)(iii) IPL | Art. 151 PBAC | Art. 256 IPL | Art. 77 APC | Art. 80 APC | distinctive character | non-traditional trade marks | Polish Act on Industrial Property Law | Polish Act on Proceedings Before Administrative Courts | Polish Administrative Proceedings Code | Polish courts | Polish law | product packaging | reputed trade marks | similarity of signs | trademark law | Voivodeship Administrative Court.